I am about 5’3”, may be a bit shorter. It is about the height of an average Indian Woman. But my family is no average. I am a dwarf among the giants. Women in our family including my mom are on an average of 5’5” and men around 5’10” .In both my family and my extended family among all the elders, siblings and cousins I’m the shortest. It was a source of great agony for me during my growing (or not growing enough years). I can see I really fell short of my parents’ expectations in this front. We visited a number of doctors in various disciplines – Siddha, Ayurveda, Unani as well as the conventional English Medicine. Bought a number of miracle pills for height enhancement as well as exercise books. Most of this only made me feel more self-conscious of my vertical deficit and I abandoned them sooner or later. I had high heels of different heights, colors and thickness and mastered the art of walking on it as well as finding a good shoe on sale. But nevertheless even casual references to my height or some dress not being suitable or more often taunts that friends/siblings at that age always choose to pick endlessly on things that infuriates one the most. Today, almost a decade after I stopped growing physically, I feel more at peace with my height. As I grew older (though not taller) I was able to accept the reality of my height and more cognizant that I am not out of place in India except probably at my taller genetics home. While having a healthy and functional body is a goal everyone must aspire for, most people especially women have very high negative body image issues and struggle to accept themselves. Girls are gifted Barbie dolls when they are young which drives their perception of how they have to look. This reality is further distorted by the models in the TV who look impeccable even amidst a bomb blast or an accident. Most of us think we are of the wrong height, weight, color, have too big or too small ears, eyes, nose etc. In India, Parents and Society often tell kids “Don’t play outside. You will become dark and no one will marry you.” When I came back from my mountaineering course with a very deep mountain tan, one of my colleagues said, “I can’t believe you were willing to sacrifice so much…” I can’t believe that he would rate a temporary loss of complexion over the life time experience I gained from my mountaineering experience. Our Tele Vision is full of ads that say a fairness cream could get you a job, a talcum powder will make you an eye candy and an aerated drink will make you invincible. This is wrong. You are more than your height, weight, color. Don’t let anyone make you feel you are any less lovable or worthy because of any of your physical features. If you are in Media or Ad industry please stop dictating what women should look like and/or act. If you are a parent, let your children know that they are worthy of love irrespective of how they look or even what they do. The world will take its own time to change, but we can change the way we look at ourselves. Truly, that is the only change that is required to win the world. Here are some remarkable women who have overcome great personal difficulties and body image issues to inspire confidence among other women. 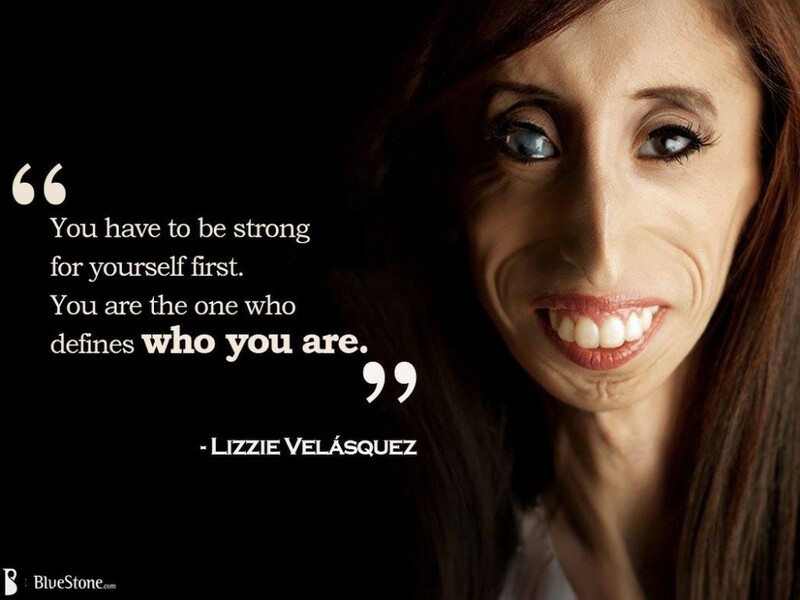 Lizzie Velasquez is suffering from a rare congenital disease which prevents her from accumulating fat in her body. Lizzie was a victim of relentless bullying. At 17, she was dubbed as the ugliest women in the world in a video posted in You Tube. Lizzie has overcome this public judgement and embarrassment to become a motivational speaker. She has also written several books targeted at teenage girls with body issues. Harnaam Kaur is a young Sikh women living in London, who due to PCOD started growing facial hair from a very young age. She stopped removing facial hair as it is against her religious faith. Harnaam was bullied and even contemplated suicide, before she came to terms with her condition and accepted herself the way she is. 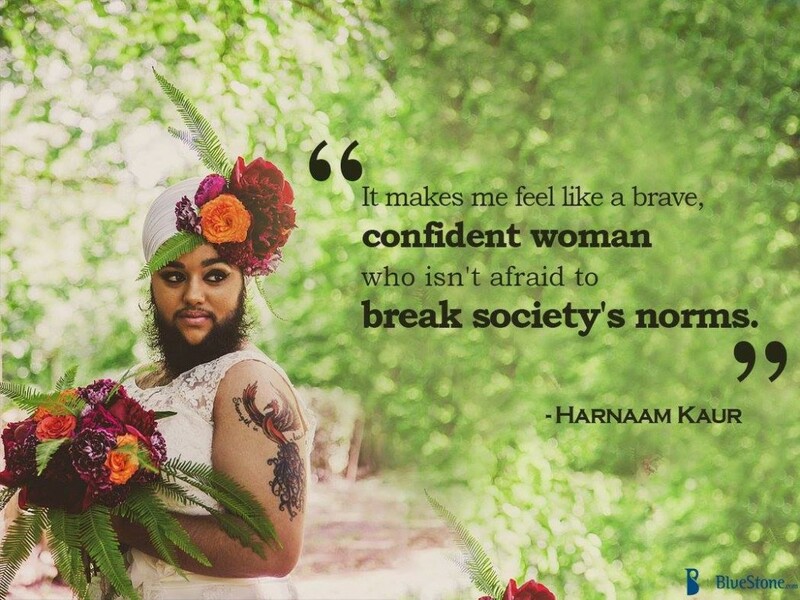 Harnaam now proudly wears her beard, is a model, a body confidence and an anti-bullying activist. Harnaam even has the Guinness record for being the youngest women with a beard, a record she proudly wears now. These Women are a great inspiration. I truly salute Blue Stone for picking these remarkable women to showcase real beauty. Do you love yourself the way you are? Are you willing to Accept yourself ? What can we as individual and society do differently to save the future generation from the stereotypes ? In the end, how you carry yourself makes you appear powerful. Nelson Mandela was neither tall, nor ably built, nor particularly handsome. But we all know the aura that he commanded in a room! Ultimately the inner beauty and a beautiful mind is what matters .this is permanent. External beauty will fade with age.